Bryheim Murray and Kyle Easley, real estate developers at the firm BK Partners, visited Uncle Bobbie's for the first time on Monday. Eli White is tired of how black customers get treated. White, an entrepreneur and photographer who lives in West Oak Lane, is working on a directory of black-owned businesses following the arrests of two African American men at a Center City Starbucks last week. He's hoping that a guide could signal where black customers can feel respected and shift how they use their spending power. "If it's no pinch in the money, there's no impact," said White, who proudly visited Uncle Bobbie's Coffee & Books, scholar Marc Lamont Hill's hip Germantown bookstore-cafe, Monday afternoon. "Something's got to start drying up, because they think it's a well that's not going to end." Activists, experts, and some local politicians, including Mayor Kenney, have opined about how the arrests at Starbucks on Thursday could be tied to implicit bias. As calls to boycott Starbucks spread, so too do evaluations of which establishments are truly welcoming to black patrons. In Philadelphia, a city where 44 percent of residents are African American, according to census estimates, these conversations touch on race, class, respectability, politics, and the persistence of segregation. Bryheim Murray and Kyle Easley used to treat Starbucks locations like temporary office spaces. 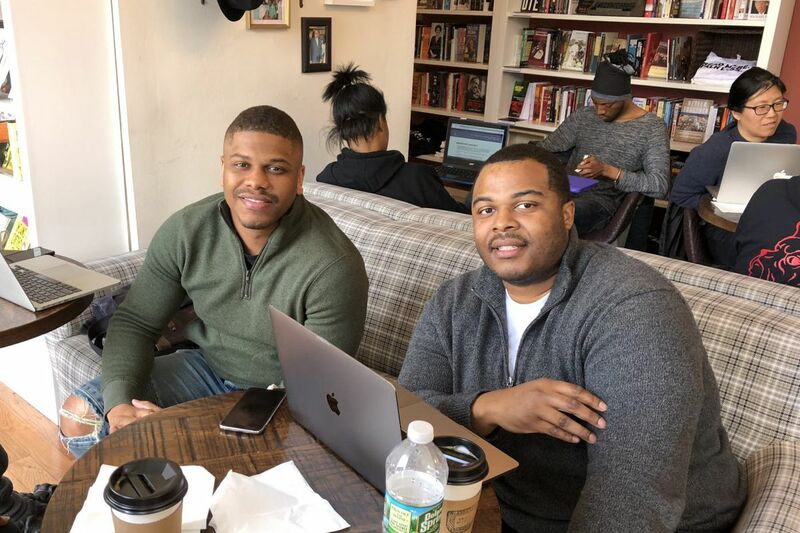 Easley and Murray, who live in Mount Airy and Callowhill, respectively, are real estate developers who spend their days on the road, finding cafés when it's time to sit down in front of a laptop. Their experiences as black customers, they say, have been overwhelmingly pleasant. "I patronize Starbucks four or five times a week," said Murray. At least he did. Easley had been hearing and reading about Uncle Bobbie's, but the Starbucks incident prompted both men to visit it Monday for the first time. The two black men who were arrested at the Center City Starbucks, Murray and Easley noticed, had been waiting to meet with a real estate contact. "That could have been us," Murray said to Easley. "I could have been waiting for you, you could have been waiting for me." Eli White proudly shows off his coffee cup at Uncle Bobbie’s, a black-owned Germantown bookstore-cafe. White remembers having an unpleasant experience at a Starbucks location last month. The barista was black, he recalled, but still, she seemed to treat white customers in line with laughter and kindness that stopped while conversing with him. "People change their tone when they get a certain clientele," said White, who feels he's always been treated differently due to his dark skin color and North Philly roots. "[They] get a familiar tone, [they] lose the professionalism." Some black patrons at Uncle Bobbie's expressed surprise that the Center City incident happened. Being followed and questioned were experiences these locals had associated with retail stores; receiving poor service and being pressed to order were conceivable scenarios in restaurants. But coffeehouses are fertile grounds for leisurely visits, they explained, and the arrests didn't fit that picture. Others patrons said they weren't at all shocked, maintaining that racial profiling could happen anywhere. Aja Clark, a volunteer coordinator at an education nonprofit, says she feels that eyes are on her when she enters certain cafés. It's "the feeling that you get," she explained. "The feeling of being under surveillance, or the feeling of it being a transaction rather than about a connection. I have to manage how I'm being received. I can't be too loud. I can't use the bathroom unless I buy something … I feel like it's different when you're in a community space than a white person's space. You're just treated differently." Yale sociologist Elijah Anderson has observed that many black people try to conform to particular notions of acceptable behavior or dress to navigate interactions with white residents more nimbly. He calls it "the dance," and argues that blacks in mixed settings do it "to disabuse" white people of stereotypes, to avoid being considered "ghetto." In his book, The Cosmopolitan Canopy, which he based on years of fieldwork in Philadelphia, Anderson developed a theory how race still colors experiences downtown. He frames Center City as an area with multiracial venues that contrast many of the city's more segregated neighborhoods. But, even in spaces that welcome diversity in theory, blacks, regardless of class background, still face stigma and potential "moments of acute disrespect." "It can be traumatic. What you thought was a cosmopolitan space becomes an exclusively white space," said Anderson, before referencing the Starbucks employee who called the police. "That manager told black America: 'You don't belong in Starbucks.' "
Whether a black customer would feel comfortable in a cafe, according to Yale psychologist John Dovidio, is an immediate, but complex process. Let's say, a black patron walks into a coffeehouse downtown in midday, and while seeing no explicit signs of antiblack sentiments, notices that there are no other black patrons inside. "It's not inclusive unless you gather evidence of people like you," Dovidio explained. "In environments that seem predominately white, whether it's a cafe, whether it's a restaurant, you get a message of whether you belong almost instantaneously." Along with appearance, history and experience heavily shape how customers sense and interpret cues. Dovidio noted that incidents of racial profiling have been widespread. If a black patron has experienced such prejudice on numerous occasions, that could impact one's rejection sensitivity, or perception of slights. But sensitivity levels could also be affected by a deep understanding of black history, or recent readings of reports on racial bias, or memories of stories passed down through family, Dovidio continued. And that can vary widely among African Americans. "It doesn't have to be a personal trauma," he said. "It becomes a cultural trauma." Clark says that cafés can show that their diversity efforts are sincere through their hiring, training and even where they buy their ingredients. She's a regular at Uncle Bobbie's. She's stopped frequenting cafés elsewhere. White isn't sure he'll be boycotting Starbucks There's one that he likes to stop at on the Atlantic City Expressway. But still, he wants to see and patronize more black-owned cafés. "We don't own much of nothing," he said. "We've got to go where black people are in management positions, where they deal with us, somewhere where they respect our dollar."